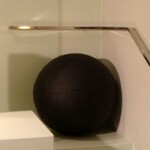 As positive as their utilisation profile may have been products such as the gymball not only found in fitness studios but in alot of home, were tended to look drab and were unable to disguise their origin as a “health product”. The Leather Sitting Ball too remedies this situation: the basic idea was to create a elegant luxurious product, with a consistent appearance that was very consciously drafted as a design object, without sacrificing any aspects of form and function. Through the use of the natural material leather – which provides a warm amd comforting sitting climate, due to the fact that it breathes- a new dimension of comfort is achieved. For the Leather Sitting Ball only the finest top quality leather is used- the so called natural grain, which will wear better than other leather and has a natural breatheabilty. Due to the fact that it is breathable it is able to offer a comfortable sitting climate. Apart from its functionality the sitting ball distinguishes itself through its casual yet high-grade, minimalist look and feel. 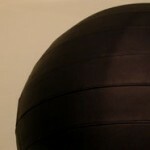 The Leather Sitting Ball has an approximate diameter of 75cm (depending on amount of air). Each piece is handmade upon request and available in a variety of colors.